No hats or sunglasses inside the bank, please. Sign on front door of a bank in Newton, Mass. 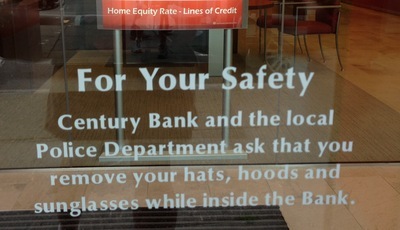 If a city wants to pass a law banning hats or sunglasses inside banks, that is one thing, but for a bank to put up a sign proclaiming that the police and the bank together are asking customers to remove the banks is another thing. I suppose a law is mandatory, while the sign is just making a request, which customers are free to ignore and see what happens. Customers are also free to choose a different bank that doesn't have a sign like that in the window, which is what I will do.